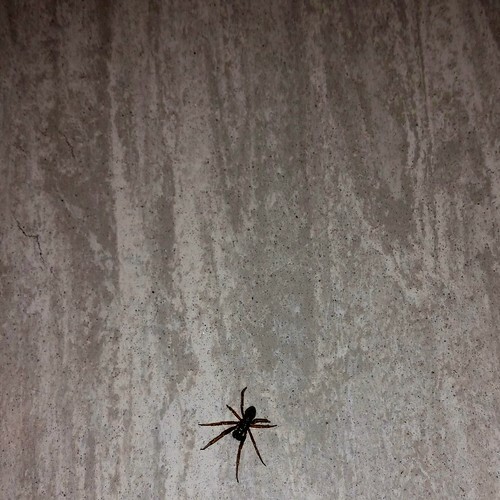 A spider walking along the floor at the college. I found this little fellow on the flow when I was walking up the stairs at work. I like the picture more for the aesthetics. The flash gave it a grayer look than it might have had otherwise. Also, you can't actually tell whether it is a floor or the wall The spider's presence of course changes how we look at the wall. No longer just a surface but a surface with something potentially sinister. I was glad that all the legs were visible and the spider itself came in so clearly. All in all, I like how this one turned out--especially because the 8 others that I took were all blurry!